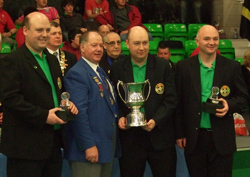 The world bowls were held in Dumfries and brought more success for Mid Ulster with the Cookstown triple of Colm McHugh, Damian McElroy and Glen Smith picking up the triples title. The triple won 6 of their 7 games in Section A losing only to Wales. In the final they met the second triple from Wales who had come tops in section B. In a closely contested game the Irish triple scored a 15 - 11 win.